Weather in Hawaii is very consistent, with only minor changes in temperature throughout the year. There are really only 2 seasons in Hawaii: summer (called Kau in Hawaiian) from May to October and winter (Ho'oilo) from November to April. The average daytime summer temperature at sea level is 85° F. (29.4 C) while the average daytime winter temperature is 78° (25.6° C). Temperatures at night are approximately 10° F. lower. The islands are an incredible collection of diverse micro-environments, each with its own unique weather, plants, and animals. As a result of the shielding effect of volcanic mountains and the differences in weather found at various elevations, you can find tropical rain forests, cool alpine regions, arid deserts, and sunny beaches - all within the span of just a few miles. Month High Avg. Low Avg. Rain Avg. Through most of the year, Hawaiian weather patterns are affected primarily by high-pressure zones in the north Pacific that pump cool, moist trade winds down onto the island's northeastern slopes. These winds are forced up-slope by the mountain heights where their moisture condenses into clouds that produce rain. Most of the rain falls in the mountains and valleys on the windward (northeastern) side of the islands. It is this weather phenomenon that creates Hawaii's rich, green, tropical environment. The wettest months are from November to March, but winter rains do not generally disrupt vacation plans, since the weather is very localized. This means that if it is raining where you are, there is almost always a sunny spot to be found around the coast. 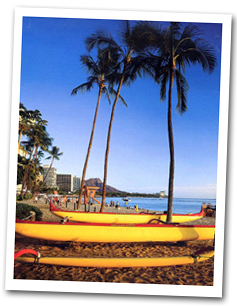 Hawaii's trade winds mean there is almost always a cooling breeze here. Several times during the year the trade winds will stop completely and the wind will switch around to come out of the south or west, bringing stormy or hot sticky weather. Islanders sometimes call this "Kona" weather, because kona means leeward or South, and this points to the direction from which these weather systems arrive. Hawaii's near-shore water temperatures remain comfortable throughout the year. The average water temperature is 74° F. (23.3 C), with a summer high of 80° F. (26.7° C). Wave action varies dramatically between island coasts and seasons. Summer waters are typically gentle on all beaches. During the winter on many north shore beaches, Pacific storms drive ocean swells towards the islands, creating Hawaii's legendary big waves. Many visitors are drawn to the natural beauty found in higher elevations such as Kokee on Kauai, Haleakala on Maui, or Kilauea on the Big Island. Temperatures in these higher locations drop 3.5 degrees for every 1,000 feet above sea level that you climb, so dress appropriately with pants and several layers of clothing. At an elevation of 10,023 feet, the summit of Haleakala can be as much as 30° F. cooler than resort areas on the coast. Also note that because of these high elevations, there is less protection from the sun's powerful UV rays, so come prepared with sun block and sunglasses.